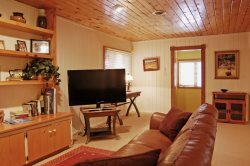 Red River Real Estate and Vacation Rentals - Ski View Condo 12, Red River, New Mexico. Ski View Condo 12 is a spacious two bedroom, two bathroom home that is on the upper level of the Ski Views. Step in through the front door and see the open living, dining area, and kitchen. Kick back and watch the flat screen TV with a DVD player giving guests the option of watching satellite or movies brought from home! The one sofa in the living room may be folded out to make one extra queen bed for additional sleeping arrangements! Kick your feet up in one of the rocking chairs and enjoy the heat of the fire in the wood burning fireplace! Many love the open kitchen that makes sure that anyone cooking is still in the action of the party! The best perk of being on the upper level of the Ski Views is having a door that leads from the living room out onto your own balcony! Walk back through the hallway you will find the two bedrooms that Ski View 12 has to offer. Both of the bedrooms are equipped with queen beds with their own TVs. These bedrooms have access to the hallway bathrooms.These condos are truly one of Red River’s most lovable places. Want a vacation home that has it all? Stay here and fall in love with the Ski Views like many before! Single story town home that is on the second floor of the Ski View Condos. Two queen beds, one queen sleepers. Ski View Condo 12 provides satellite and free WiFi. Ski View Condo 12 pet policy: Sorry no pets! Awesome experience! We enjoyed it so much!!! great place to watch the rain and great view of "The Face" and main ski lift. Balcony was a favorite for the whole family. I only visited with two different people, one to set up our stay and book the room and the other to direct is to our key. Both were very friendly and took great care with us! We loved our stay, and will return again !